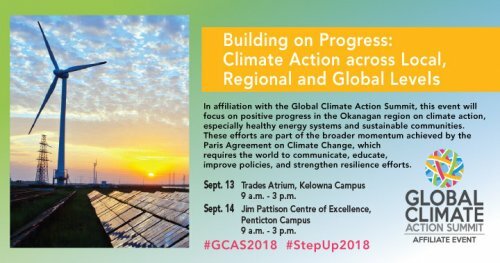 Okanagan College and the Global Empowerment Coalition of the Central Okanagan have partnered with the Global Climate Action Summit to host an affiliate event during the Summit. The event will include an ongoing expo with exhibits from local businesses and organizations helping to achieve climate progress and building toward a more sustainable future. The event will be open to the public and the press.